Had he found a horse, I'm convinced Curns's portrayal of Richard would have just kept getting better and better. 1. 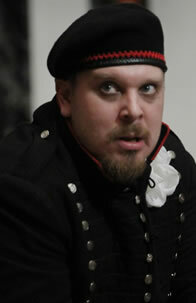 Benjamin Curns as Richard III, American Shakespeare Center, Blackfriars Playhouse, Staunton, Va., 2012. Benjamin Curns as Richard in Henry Vi, Part Three. Photo by Tommy Thompson, American Shakespeare Center. I've seen a total of 18 Richard IIIs. I've seen, on stage, Antony Sher's, Derek Jacobi's, Ian McKellen's, Kevin Spacey's, Mark Rylance's, and Ralph Fiennes. I've seen a Deaf Richard, I've seen a Richard in the future, I've seen a Richard in a parking lot. Only once, though, have I seen Richard's real soul—the "tragic hero" as Shakespeare intended him—and that was Ben Curns completing his portrayal of the character in Shakespeare's War of the Roses tetralogy. What Curns accomplished was a mind-searing performance from first line to last, the work of a devoted Shakespearean who didn't just study the hunchbacked villain. He grew up as Richard over the previous two years in Henry VI, Parts Two and Three. His first indelible moment came in 2010 with his "Somerset-on-a-stick" stunt near the end of Part Two, when Curns's Richard flipped Bob Jones's Somerset overhead on the tip of his spear. His rivalry with Sarah Fallon's Queen Margaret intensified through Part Three the following year as a mano-a-mano masterwork. But it was his King Richard that proved to be the crowning achievement, his and the character's as Richard's pathologies coelesced into the fallible monster meditating on the aftermath of our "winter of discontent." The image that always comes immediately to my mind when I think "great Shakespeare" is Curns performing the "Richard loves Richard" soliloquy—the last in the play—the words of a man who grew up in the singular conditions that was Richard's. Had he found a horse, I'm convinced Curns's portrayal of Richard would have just kept getting better and better. Maybe it's not fair to compare a three-part Richard to the one-parters; more important, though, is that this is how Richard should be presented, the way Shakespeare wrote him. Besides, I'm not merely comparing Curns's with other portrayals of Richard. I'm placing him at the forefront of all my Shakespereances.Click here for reviews of Henry VI, Part Two, Part Three, and Richard III, and an interview with Benjamin Curns and Sarah Fallon. 2. 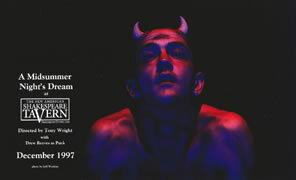 A Midsummer Night's Dream, Atlanta Shakespeare Tavern, 1997. Sarah and I hosted my parents and my two sons for a post-Christmas treat at the Tavern. Dream almost always provides some good laughs somewhere along its course, and I've seen some great Bottoms, Titanias, Oberons, Pucks, Snugs, Quinces, Theseuses, Hyppolytas, and even a Philostrate—but never all in one night, and seldom do the lovers hold my interest. This production not only scored hilarious performances with every one of those characters (a trio of musicians played Philostrate), it also had a quartet of lovers firing on all cylinders to sustain an edge-of-your-seat thrill ride. Yet, stealing the show were three actor/dancers, Angus Whyte, Jody Reynard, and David Craven, who doubled as the fairies and the Rude Mechanicals. As the former they danced with skill and grace; as the latter, presenting Pyramis and Thisby, they clumsily tottered across the stage and into the walls like ballet on a bender. By the time Quince screamed at Bottom's Pyramus to die already, I was treated to the indelible image of three generations of Mintons around our table so convulsed in laughter every one of us was wiping tears from our cheeks. 3. Anthony and Judi as Antony and Cleopatra, National Theater, London, 1987. Allison Glenzer as the Jailer's Daughter. Photo by Lauren D. Rogers, American Shakespeare Center. 4. Allison Glenzer as the Jailer's Daughter in The Two Noble Kinsmen, American Shakespeare Center, Blackfriars Playhouse, Staunton, Va., 2013. If this had played in New York or London, the buzz—palpable in the streets of Staunton—over Glenzer's performance as the Jailer's Daughter would start a rush on the box office and the annual awards lining up behind her. Glenzer weaved each of her many considerable talent threads into a tapestry of an 18-year-old girl who descends from giddy man-crush to tormented madness before ending in a state of peaceful insanity. She maximized her experience with the Blackfriars playing space, where the audience sits on three sides and on stools on the side of the stage itself, engaging with individuals in her many soliloquies, involving them in the action, even eliciting spoken responses from them. Her performance was improvisationally daring, physically funny, contextually comic, tear-inducingly tender, tragically touching. She earned exit applause with each of her scenes, except her last, when she asks the Wooer, pretending to be Palamon, if they will sleep together; encouraged by the doctor, the Wooer says they will. "But you shall not hurt me…If you do, love, I'll cry," Glenzer's Jailer's Daughter said, half to the audience with such vulnerability that as she slipped out the door she left the audience too paralyzed to applaud. Glenzer achieved ultimate theatrical art and one of the greatest Shakespearean performances I've ever seen.Click here for a review of this Two Noble Kinsmen. Jonathan Minton as Rivers, left, with Vince Phillip as Richard III. Photo by Joe Hamel, Hudson Warehouse. When you love Shakespeare and dig the theater as much as I do, how cool is it that your son becomes a professional actor—a Shakesperean one at that? Makes sense, some might say, that he would be influenced by my interests, and our taking him to Shakespeare plays when he was just 7 years old did first flame his passion. But the onus of developing his talent and successfully basing himself in New York is entirely on him. As he grew up with his mother in Anchorage, Alaska, where he honed his craft in school, we never got to see him perform until he played the Officer in a 2012 Hudson Warehouse production of A Comedy of Errors. He was pretty darn good. And he got better. He brought an interesting dimension to Rivers in that company's Richard III that same summer. The following winter he showed me depths in Aguecheek I'd never seen before in the Mad and Merry Theatre Company's Twelfth Night. In the summer of 2013, he killed it as Demetrius opposite a top-tier Helena in A Midsummer Night's Dream at Millbrook Playhouse (Mill Hall, Pa.), and then played Banquo in a touring production of Macbeth for the Pennsylvania Shakespeare Festival, a performance we weren't able to see. We did see his touring production of Dream and Julius Caesar at the Shakespeare Theatre of New Jersey in spring of 2014, where his Theseus/Oberon (on stilts) in the former and his title role in the latter quite simply astonished me. Of course, I'm biased; I love great Shakespearean performances, so Jonathan had a high standard to measure up to.Click here for an account of my Shakespearean journey with Jonathan; here for a review of Comedy of Errors; here for Richard III; here for Twelfth Night; here for A Midsummer Night's Dream at Millbrook; here for A Midsummer Night's Dream at Shakespeare Theatre of New Jersey; and here for Julius Caesar.